I’m excited for Spider-Man: Far From Home. It looks like it will be a lot of fun. That is why I decided to check out the hoodie from USA Jacket that was inspired by the film. Here’s my experience with it. Full disclaimer, they did send me the hoodie to review. Here’s an image of the hoodie on their website. That looks like a nice hoodie, doesn’t it? Well, I’ll start with the things I don’t like about it. For starters, mine is not red and black, but red and navy (pictures below). This isn’t bad, it’s just not what I was expecting. I reached out to them to make sure I wasn’t just sent a fluke, and they informed me that some of the jackets are blue and not black, so that’s warning number one. 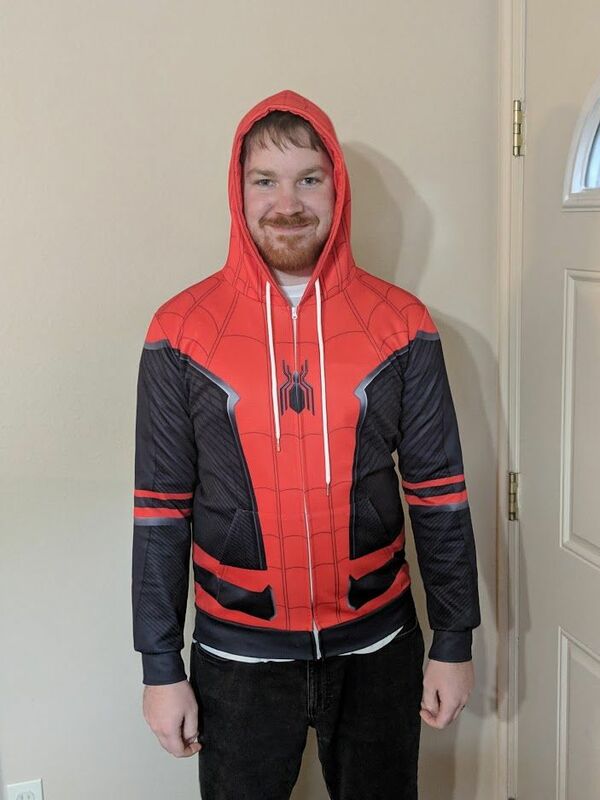 My second problem with the hoodie was that I used the size chart to determine I needed a Medium, but I like my hoodies to be big on me, so I ordered a Large. The Large fit me perfectly, so you may want to order one size up if you want this jacket. Third, the material was not what I expected. It’s not a bad material per say, it’s just different from what I expected. I was expecting a normal cottony type of material, but apparently there’s a healthy amount of polyester as it feels similar to spandex. Once again, if you like that kind of material, great, it’s simply not what I expected. Now for the positives. If you like the material that it’s made out of, that’s great. If you’re looking for a lightweight hoodie, this is perfect. It is perfect if you live in a warm place that gets a little cool at night. This would not be great for snowy places though. It is also a well-made hoodie. I have no qualms about the quality of it. Also, the hoodie does look cool. It doesn’t look as cool in blue, but it is still cool and helps you show off your Spider-Man pride. The hoodie is fine as long as you don’t mind potentially a different color than expected and the sizing to be a little small. I don’t know if it’s worth the $109.99 price tag, but if it were to go on sale, it might definitely be worth getting for those chilly days and nights.